The Shed Equipment Inventory as of 14-May-2004. Check with the Cotters for current availability. All Lighting-Sound-Film systems and related theatre items are now available at Southern Lites, in Charleston, SC. These items and contact info are now listed on the Southern Lites page. For Sale of Property, see link at bottom of page for Henry Chambers and Beaufort Realty. Please Note: Inventory items are NOT included in the Property Sales Price! 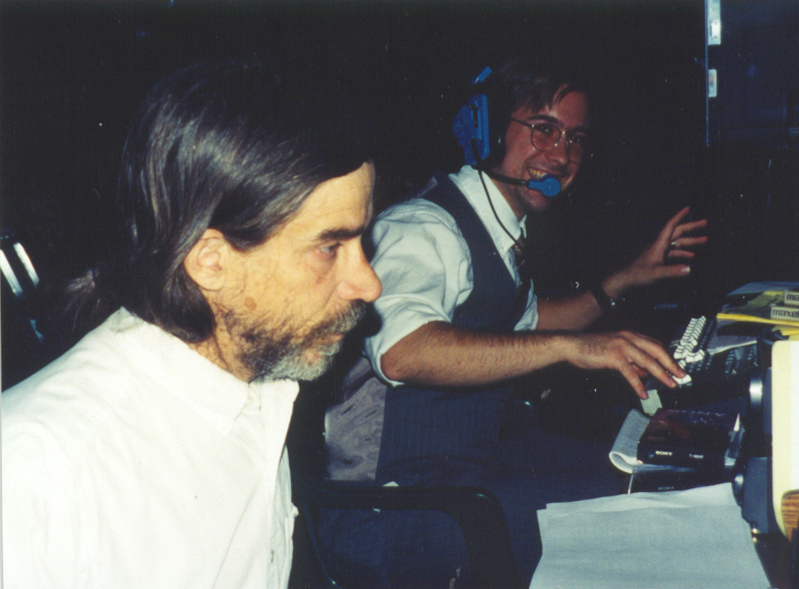 Jay Dyck and Stephen Pheil work the light & sound boards for The Mousetrap. Louts (Gail and Kristi) and Wendy pause during rehearsals. 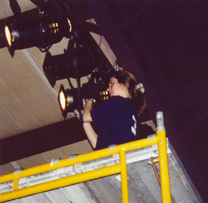 Wendy Pearson focusing lights for Butterfingers Angel . . . Contact Pete & Karen Cotter kcarts33-shed[atsign]yahoo.com (replace "[at sign]" with the "@" when using this address! )and see Tech Specs for Equipment Inventory & Pricing. Copyright (c) 1999-2004 All rights reserved; The Shed/K Cotter.